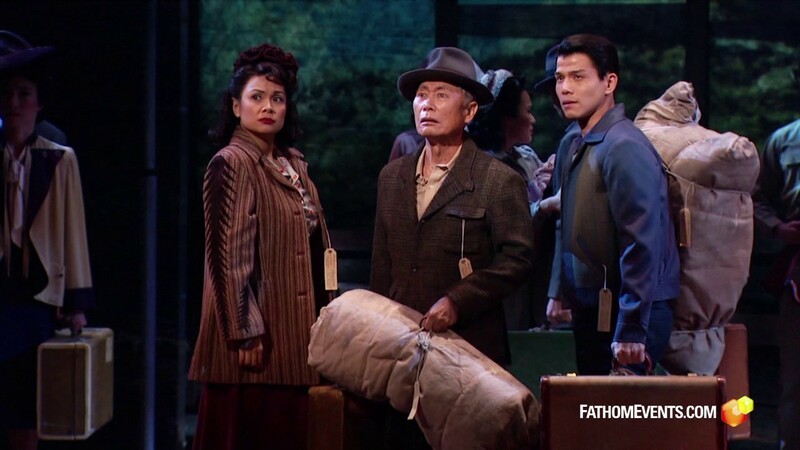 Allegiance, a musical about Japanese-Americans interned in camps during World War II, was rebroadcast to theaters on December 7, the 76th anniversary of the Japanese attack on Pearl Harbor, the catalyst for the upheaval that many Americans of Japanese descent endured. This is an important topic, one that one might not lend itself naturally to a Broadway musical. Allegiance is a noble work, one that has great intentions and strong performances. However, I got the sense that it could have been better, richer, more developed. Isamu 'Sam' Kimura (played as an old man by George Takei, a young man by Tommy Leung), is getting ready for an annual Pearl Harbor Day commemoration in what I presume is the present day when he receives news. His sister Keiku 'Kay' (Lea Salonga) has died. Allegiance then goes into the past to show how these siblings eventually broke apart. Things were idyllic when Sam and Kay were growing up with their father Tatsuo (Christopheren Nomura) and their Grandfather or Ojii-chan (Takei in a dual role) in California. Then came December 7, 1941, and that Day of Infamy shook the family. Tatsuo remembers how back in the first World War, mobs burned down a German shopkeeper's home. Sam wants desperately to enlist but being of Japanese descent, the Army wants nothing to do with him or 'his kind'. It isn't long before all Americans of Japanese descent are rounded up and herded to various camps. The Kimura family is sent to Heart Mountain in Wyoming, forced to sell their valuable farm in a hurry for a ridiculously low price. At Heart Mountain, the Kimuras are doing their best in this strange and miserable world. Sam tries to be proactive in getting better conditions for his community with petitions and showing his American pride. Tatsuo is disheartened by his treatment and displeased by Sam's 'rebellious nature'. Kay, who has been Sam's mother-figure since their mother died in childbirth, tries to be the mediators between these two. Ojii-chan tries to keep everyone's spirits up with card tricks and a more upbeat personality and encouraging all to keep a spirit of Gaman (to carry on). We see Mike Masaoka (Greg Watanabe), a self-appointed spokesman for the Japanese-American community, float in and out of Allegiance, trying to balance between accommodating the government and pushing to improve Japanese-American internees lives, with the ultimate goal of getting them out of the camps and back home and in the service. We also see Sam and Kay finding romance: Sam with Hannah (Katie Rose Clarke), an Anglo nurse, and Kay with Frankie Suzuki (Michael K. Lee), who unlike Sam has nothing but contempt for the situation and is not willing to fight for a country that has locked him up and had his parents arrested (Mr. and Mrs. Suzuki ran a Japanese-language school in Los Angeles). Eventually, the divide between Sam and Kay becomes too great; Sam sees joining the Army once the ban against Japanese-Americans is lifted as a way to both show his real patriotism and get the Americans to see his community as loyal Americans. Kay sides more with the draft resisters within the community, particularly their leader Frankie, who is the father of her unborn child. Frankie's attempted escape caused Hannah's death, which Sam, fighting in Italy, knows nothing about. Neither does he know that Ojii-chan too has died, though his death at least was a happy one: working in his beloved garden where a flower (which in Japanese sounds like 'Hannah') miraculously sprouted. Tatsuo's refusal to say 'Yes' on two questions on a loyalty questionnaire gets him locked up, with any privileges coming from his connection to the hero Sam. Finally, the war ends, the internees are released and Sam comes home. He comes home to find his grandfather dead, his sister with a daughter and worse, married to Frankie, whom he considers a coward and a traitor. Worse is when he finds out that Hannah is dead and who had an accidental hand in it. Sam finally believes Tatsuo favors Frankie over Sam, the son he always wanted versus the one he had. With that, Sam joins Masaoka in Washington and breaks with his family forever. Now, back to the present, Sam goes to Kay's funeral, where the 'executrix' of Kay's will gives him an envelope. Inside is the Life Magazine that featured Sam on the cover, with the words 'My Hero' written in Japanese by Sam's father, and the Purple Heart he lost when Kay ripped it off him in their final fight. We then learn that the 'executrix' is really Kay's daughter. Her name: Hanako, named for Nurse Hannah. 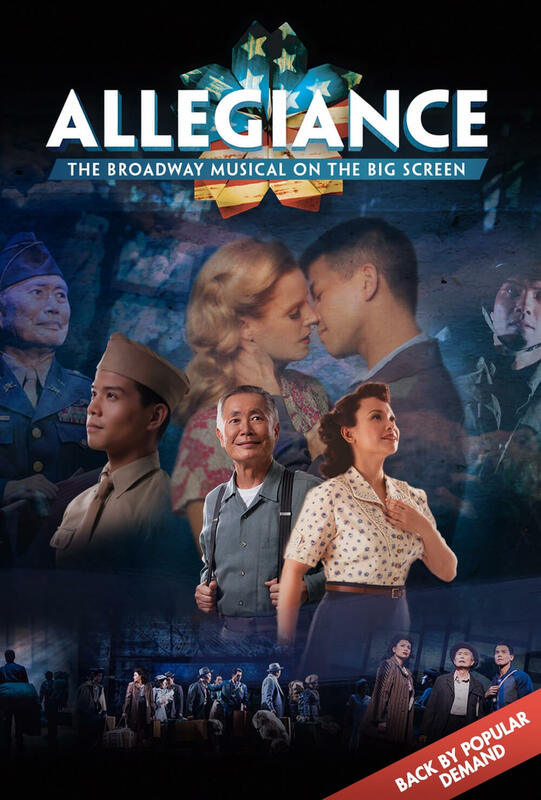 Allegiance has surprisingly upbeat moments for a musical built on a shameful part of American history. The opening number, Wishes on the Wind, is as lovely an opening as one can find from a show where we know there will be great tragedy. I would argue though, that here is where we have a problem with Allegiance: the actual musical numbers and how they are structured. Wishes on the Wind, for example, gives us an almost bucolic world, where there is not only peace and harmony but true absence of bigotry, more Imagine than You've Got to Be Careful Taught. As such, once we're thrown into the war and the hysteria mixed with racism, why and how the Anglo farmer who was so pleasant and happy to join in at the traditional Japanese festival turned into the greedy land-grabber making a killing off his former friends. Perhaps the oddest moment in Allegiance is with Frankie's big number, the intentionally ironic Paradise. As Frankie lists the injustice and miserable conditions of their 'paradise', much to Sam's displeasure, the dialogue tells us this was specifically created for the Heart Mountain dance they had organized. Paradise is a good song, but I was not convinced that it fit in the way Allegiance placed it. This number of mockery of their subservience and resentment I think would have worked better if it were structured as a response to Sam in conversation at the dance versus a 'special surprise performance'. It might have even served as a counterpoint to Sam's earlier big number, Get in the Game, where Sam rallies the Heart Mountain internees to organize baseball games as a way to show their true Americanism. Sadly, we never saw them actually play a game, but the contrast between Get in the Game and Paradise could have worked well for Allegiance, even though I can see that maybe having two peppy numbers back-to-back might not have worked. Oddly, I never believed in either the Sam/Hannah or Kay/Frankie romances despite the show's best efforts. Perhaps it was because one knew they were coming. When Sam and Hannah have their love ballad, With You, it sounded like a typical showtune ballad versus a 1940-style torch song in the style of a Vera Lynn or Doris Day. 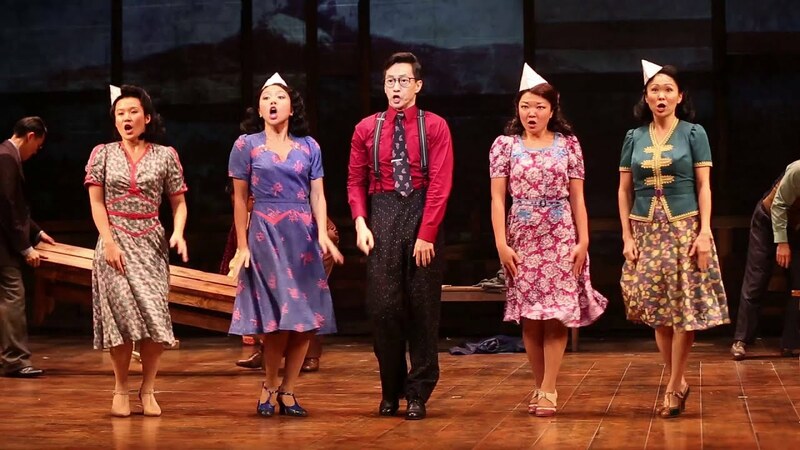 The music and lyrics by Jay Kuo had several numbers that had that World War II-era feel (especially the 442 Victory Swing, where part of it is almost deliberately dismissing the misery the U.S. put their citizens through as the internees were finally released during the number). Why therefore, at this crucial moment, Kuo did not try to find something closer to Sentimental Journey or We'll Meet Again instead of something closer to some Taylor Swift or Katy Perry ballad I don't know. Kuo's book, written with Marc Acito and director Lorenzo Thione, I think rushed through things a bit. The rush from the lovely pre-war world of Wishes on the Wind to the camps enduring Gaman. The romances especially seemed rushed, and not helped by some of the performances (I thought Clarke was the weakest, showing no real change from what was meant to be disinterest to deep passion for Sammy). There were good lines in Allegiance that underscored the hypocrisy of the internees' plight. "We're at war with Italy but they're not locking Joe DiMaggio up," one of the men angrily remarks. As Sam struggles between his sense of duty to his father and his country, Ojii-chan gives his take on things: "A boy always obeys his father, but a man does not". However, one line stuck out to me that if for a word change, could have made Allegiance much better. As Sam talks about joining once he can, he tells his father "I'm an American citizen with a chance to prove our loyalty," or something to that effect and emphasis mine. I could not help being displeased by the use of 'citizen': to me, it still suggests 'foreignness' and 'separateness'. I wish he had said, "I'm an AMERICAN," to make his true nature clear. While I though Clarke was the weakest, I have nothing but love for Salonga, Leung, and Takei, who were wonderful in their roles. Higher is a showcase for Salonga, and she is spot-on both in the delivery of all her songs and as Kay, who finds that love does tear them apart. Leung is commanding and pleasant as the more America-loving Sam save for the Hannah romance, which I felt was the weakest part. We can go beyond the fact that Salonga and Leung are not actually of Japanese descent. 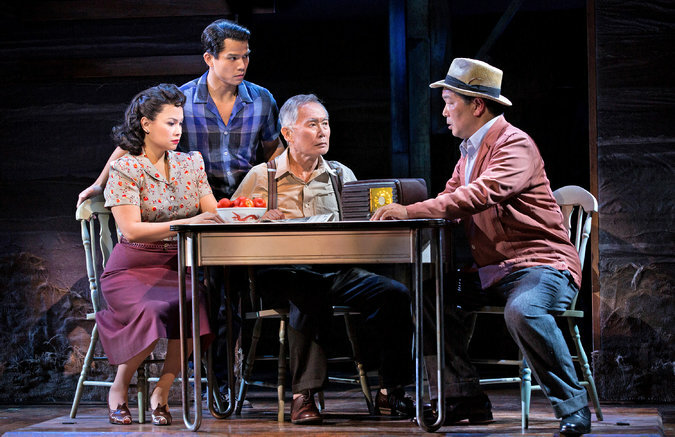 Their performances are integral to Allegiance's success. Takei takes on double duty, most of it as Ojii-chan, and he brings a nice touch of humor. When asking in a soft Japanese accent, 'Where are we? ', Kay answers, "Wyoming". "I didn't ask 'why? '", he gently scolds. "I ask 'where'?" Ojii-chan's efforts to find 'the right card' and getting it wrong twice was also amusing. He also delivers as the older Sam, a man filled with anger but who in the end is able to find peace with all that he has endured as both a prisoner and soldier of the United States. Allegiance has good intentions and draws important attention to an important story. 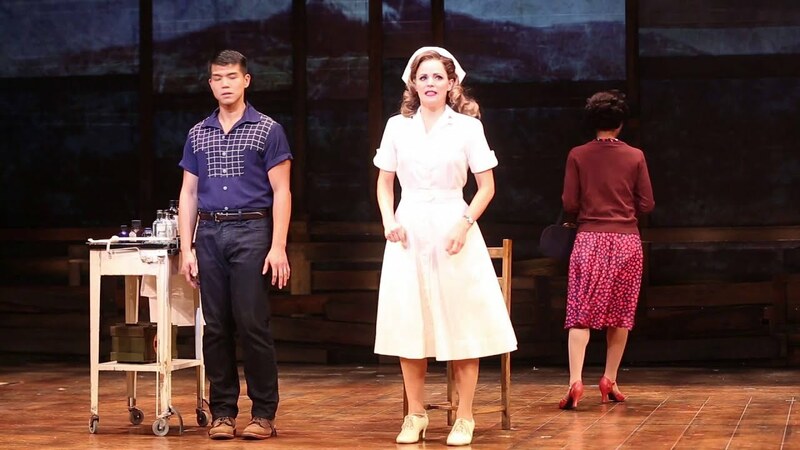 It might find new life with some changes in structure, but for now, without a 'big number' and with a somewhat melodramatic story (what are the odds that Nurse Hannah would be killed as an indirect result of Frankie), Allegiance is a show that is good but could have been better.